Born in 1810, Rawlinson entered military service with the East India Company at the age of 17. While sailing in a vessel bound for India via Cape Horn, he relieved the monotony of the voyage by publishing a ship's newspaper. One of the passengers was the governor of Bombay and a prominent scholar. They had many long conversations on Persian history, language and literature which awakened Rawlinson's interest. By the time he was 23, he was a major on duty in Persia in the employ of the Persian War Ministry, with the task of reorganizing the Shah's troops. He was a keen student of oriental languages and he became interested in antiquities, particularly cuneiform inscriptions, then unreadable. Unaware of the work by Grotefend and others, he used the same inscriptions and the same methods to decipher the names of Hystaspes, Darius and Xerxes. He deciphered four other names too, and even possibly some other words. When he discovered Grotefend's writings in 1836, Rawlinson realized that he had made significant improvements on the schoolmaster's work. But now he needed more inscriptions, with names, to continue. 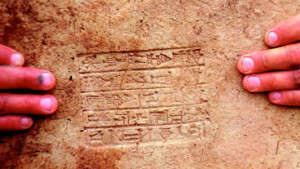 Rawlinson learned of an inscription placed on the side of a double-peaked mountain which overlooks the ancient road from Babylon to Ecbatana, now called Hamadan. Inscribed on a smoothed cliff 100 metres above the valley floor, it is known as the "Behistun Rock", after the nearby village of Bisistun. 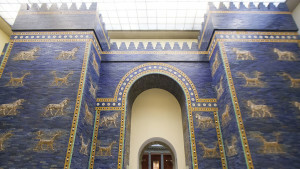 The inscription was inscribed by Darius I, king of Persia about 516 BC as a monument to his reign. It describes how he defeated and killed the usurper Gaumata who had seized the throne after the death of Cambyses. The record is in three languages: Old Persian, Elamite and Akkadian, all written in cuneiform script. Above are life-size figures of Darius and his court receiving the submission of the rebels. Over the scene the god Ahura Mazda spreads his wings. In 1835, Rawlinson made the difficult climb up the sheer cliff to copy the Old Persian and Elamite inscriptions. Some of it was done while dangling from a rope. He was also able to make a "squeeze" of papier mache from the text. The Akkadian version was copied some years later using enormous ladders, long cables and hooks, most of which was hard to come by in the Middle East. By using the 14 characters he already knew of the Old Persian script, combined with his knowledge of Zend, a cognate language of Old Persian, Rawlinson was able to make some progress in deciphering the inscription. Finding similar groups of signs, and guessing that they were the names of the king and his father, he was able to find out all 43 letters of the alphabet. Fortunately, Old Persian was a simplified language. The Behistun Rock offered a number of advantages. 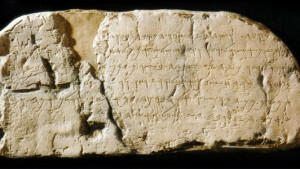 Its letters were clear and legible even after 2,500 years. It was a trilingual inscrition, and a long one, which offered many comparisons. And because of its contents, it contained many proper names, which are the things a decipherer looks for first. Rawlinson continued work on it until 1847 when he was able to publish a translation of the Old Persian text, with grammatical notes and analysis. He then started on the much more complex Akkadian. The discovery that this was a Semitic language alun to Hebrew helped make work easier. Due to political friction with Britain, he left Persia and became a political agent in Kandahar, Afghanistan. Later he was transferred to Baghdad where he was British Consul until 1855 when he returned to England. The third language was Elamite. The problem here was that the signs were not alphabetic. A single sign could be at times a syllable, or a whole word, or different syllables or even several different words. The words could change their meaning depending on context and the pronunciation of a word was not derived from any of the signs that made up the word! Scholars despaired of deciphering it, and Rawlinson was accused of playing "unscientific jokes". At this time, when the muddle seemed complete, nearly 100 clay tablets were excavated at Kuyunjik (ancient Nineveh). They turned out to be lists of phonetic values, along with the meanings of ideograms, correlated with alphabetic scripts. One was even an encyclopedia with pictures of objects arranged in rows labelled with their Sumerian and Semitic names. With this important find, the decipherers had "dictionaries" to help them. When Rawlinson issued his claim that he could read the most difficult of cuneiform scripts, like all great intellectual pioneers, he was ridiculed on all sides. The Royal Asiatic Society in London took an unprecedented step. They sent a sealed envelope containing a newly discovered, lengthy Assyrian inscription to the four greatest cuneiform experts of the day requesting an urgent translation. 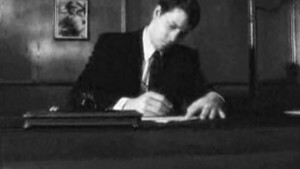 The four experts were Rawlinson, Talbot, Hincks and Oppert. None knew that any of the others was occupied on the task. Each worked according to his own methods. Finally the four sealed envelopes were returned and opened, and a commission examined the texts. The four translations were virtually identical. It was published in 1857 as "An Inscription by Tiglath- Pileser, King of Assyria". Although many scholars working in the field of Assyrian history resented this extraordinary experiment, the result was convincing proof that the cuneiform could be read. Ten years later the first grammer of the Assyrian language appeared, and today students are able to read cuneiform writing almost as easily as a newspaper. Rawlinson was elected to Parliament in 1858 and for a time was British Minister to Teheran. He died in 1895.